Welcome back readers. I tried a different formula for what I chose to read this time around. I asked my wonderful wife to pick something out that she thought sounded interesting for me to read. I did this because I know that I have certain tastes, and I sometimes wonder if I am missing out on some good reads because of those tastes. What she picked was a book I have heard about but never really gave it a second look. Why? I don’t really know. So on to my review. 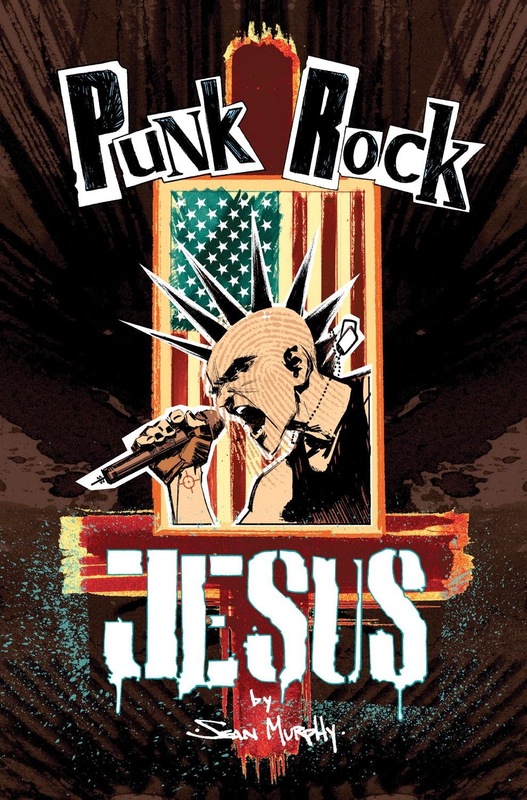 Punk Rock Jesus is a pretty complex book that tackles some really heavy themes. It’s about a corporation in the near future that decides to make a clone from DNA found on the Shroud of Turin, which they place into the womb of a teenage virgin named Gwen so that they can film the life of “The Second Coming of Christ” everyday from the day he is born. It is pretty clear right out the gate that the exec in charge of the day to day of the show could care less what happens to Gwen as long as his ratings and Chris, the clone, are controlled the way he believes they should be. Chris and anyone else to do with the show are kept locked away on a island “for their safety”, and not allowed to have contact with anybody off of the island. Well except the scientist that performed the cloning procedure. Who has the right to go home every night. As could be expected the stress of being the mother of Chris starts to take it’s toll on Gwen causing her to fall into extreme fits of depression and turn to alcohol and substance abuse. Leaving the scientist and her daughter who is the same age as Chris to help him cope with the life he was born into. But as time goes on and Chris learns more and more of who and what he is supposed to be Gwen just keeps getting further and further over the edge. Eventually Gwen goes so far over the edge that she is removed from the show and Chris’s life. But on her way out she asks Thomas the ex IRA member who is head of security. Finally Chris hits his breaking point and starts rebelling against the corporation behind the show. He learns to hack the holographic teaching system and gains access to all of the knowledge they had kept from him. He discovers punk and rock music through vinyls that belong to Thomas. All of his rebellions lead to Chris to questioning the existence of god and even the DNA used to make him. Chris gets free of his captors and becomes the frontman of a punk band that he had been listening to called the Flack Jackets. He uses his new found voice to spread his message about his questions of faith and the governments corruption of the system. Thomas is a very interesting character to this series. His backstory ends up as the perfect counterbalance to Chris. He spent time with the IRA until a simple bomb to send a message takes the life of a girl in the wrong place at the wrong time. An event that leads him to make a vow to never take another life. Sean Murphy really tackles some heavy subject matter in Punk Rock Jesus. HE touches on the ethics of cloning. The way that television can use reality shows to exploit and control the participants of the shows. He even throws in a commentary on the religious groups who manipulate the bible to make it a weapon against whoever and whatever they want.But the best part is the fact that even that Sean Murphy unfolds the story so that the reader can interpret the messages of the story their own way. It should be no surprise that the art in Punk Rock Jesus is breathtaking. What was amazing though is that the lack of color in the art makes it even more beautiful than all of the other books I have read with Sean Murphy on art. And Murphy really knows how to make the reader feel an emotion at any moment. Whether it be sadness, anger, confusion, etc. The layouts Murphy uses are complex, but easy to follow. Another amazing thing about Sean Murphy’s art is his ability to properly use the splash page. Which is often times abused in modern comics. This was a real treat to me. I am really glad I asked my wife to choose a book for me to read. Because I may have never got around to picking this one up if I hadn’t. I wouldn’t suggest this title to just anyone. I feel it is a lot like Preacher in the fact that the religious context could offend somebody who is not open to having their beliefs questioned. Thanks again to all of my readers. If you have any questions or comments or suggestions of more books to checkout, please post them in the comments section. And as always, keep reading comics fans.